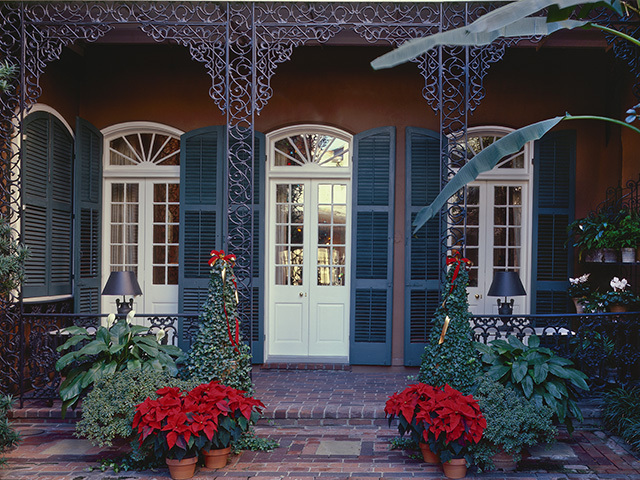 Tuesday–Saturday: 10 a.m., 11 a.m., 2 p.m., and 3 p.m.
Sunday: 11 a.m., 2 p.m., and 3 p.m.
Just in time for the holiday season, The Historic New Orleans Collection will once again offer Holiday Home and Courtyard Tours of the Williams Residence. The two-story brick townhouse, built in 1889 and restored in the 1940s, was owned by THNOC’s founders General L. Kemper and Leila Williams. Filled with antiques and art collected by the couple in their wide travels, the house was occupied by the Williamses from 1946 through 1964. From December 1 through 30, visitors to the residence will learn about the couple’s Thanksgiving, Christmas, and New Year’s Eve celebrations. The residence will feature a beautifully decorated dining room and elegant tree with vintage ornaments. Photos of their holiday parties will also be on display. In keeping with the Williamses’ tradition of natural greenery, fresh wreaths, garlands, and flower arrangements—all donated by Arbor House Floral—adorn the residence and public spaces at THNOC’s Royal Street property.